Over the Thanksgiving weekend Julianne and I, along with Marissa and Adam, were blessed with the opportunity to go to Louisville and enjoy the spectacle of the traveling Broadway performance of “Wicked: The Untold Story of the Witches of Oz” which included parts performed by Julianne’s cousin Tregoney Shepherd. I count this as one of my blessings as it is EXTREMELY rare for us to go to a Broadway production of this caliber…even if it is a National Tour production of one. Tickets are pricey and getting there, etc., can be a hassle. But we had to go to this one. First of all, Julianne’s cousin was in it. Tregoney is a Broadway actress and performer, an acting and voice coach and an all around fun person! 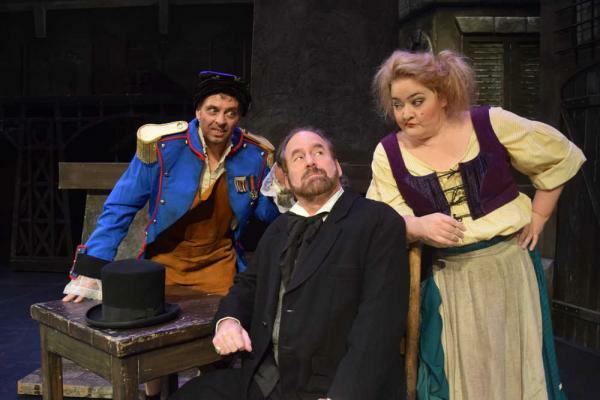 We were blessed to see her a few years ago when she came to Louisville in the National Tour of “Les Miserables,” where she played Madame Thenardier. That too was an amazing performance. More recently Tregoney was in the National Tour of “Mary Poppins” and has been in “Wicked” for the past few months. 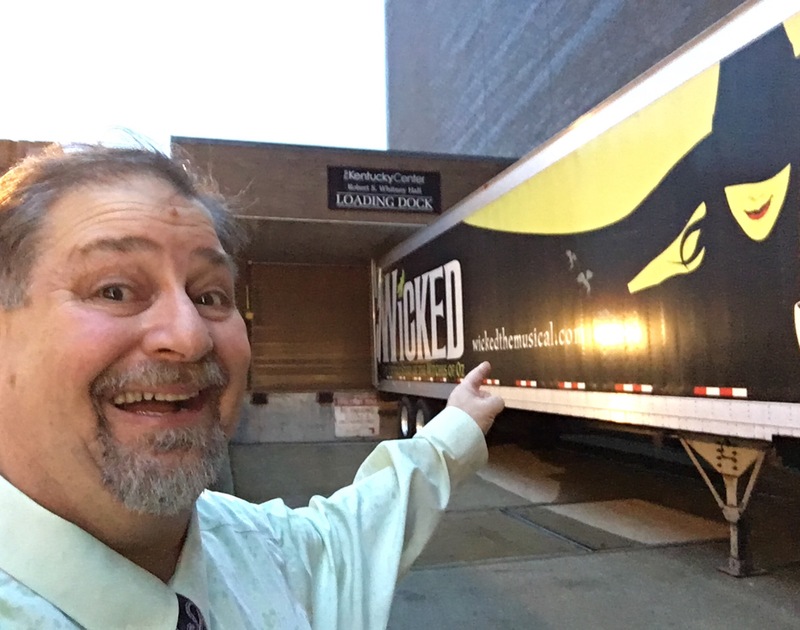 Wicked: The Untold Story of the Witches of Oz is a musical with music and lyrics by Stephen Schwartz and book by Winnie Holzman. It is based on the 1995 Gregory Maguire novel Wicked: The Life and Times of the Wicked Witch of the West, an alternative telling of the witches from the 1939 film The Wizard of Oz and L. Frank Baum’s classic 1900 story The Wonderful Wizard of Oz. Like most people my age, I grew up with this movie and have seen it dozens of times. The musical is told from the perspective of the witches of the Land of Oz; its plot begins before and continues after Dorothy’s arrival in Oz from Kansas and includes several references to the 1939 film and Baum’s novel. 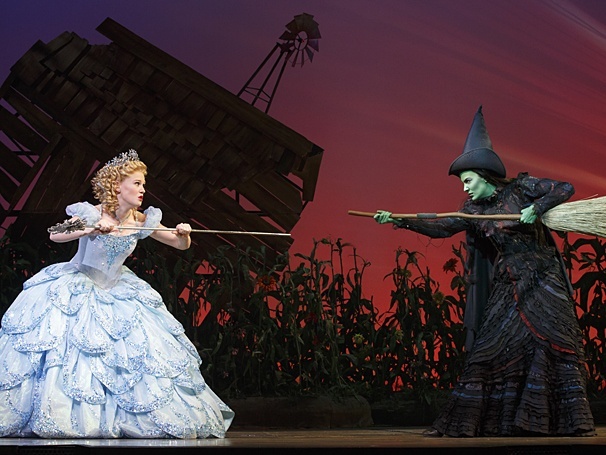 Wicked tells the story of two unlikely friends, Elphaba (the Wicked Witch of the West) and Glinda, who struggle through opposing personalities and viewpoints, rivalry over the same love-interest, reactions to the Wizard’s corrupt government, and, ultimately, Elphaba’s public fall from grace. 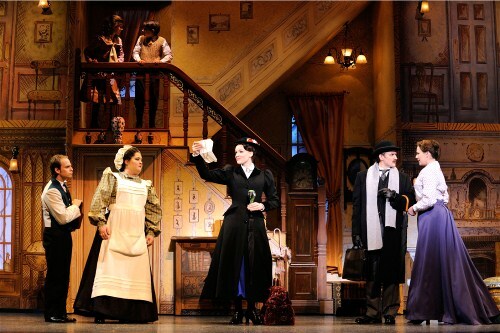 Like any Broadway production, the stage is spectacular and the costumes are phenomenal. And, of course, the acting and singing are as good as it comes. 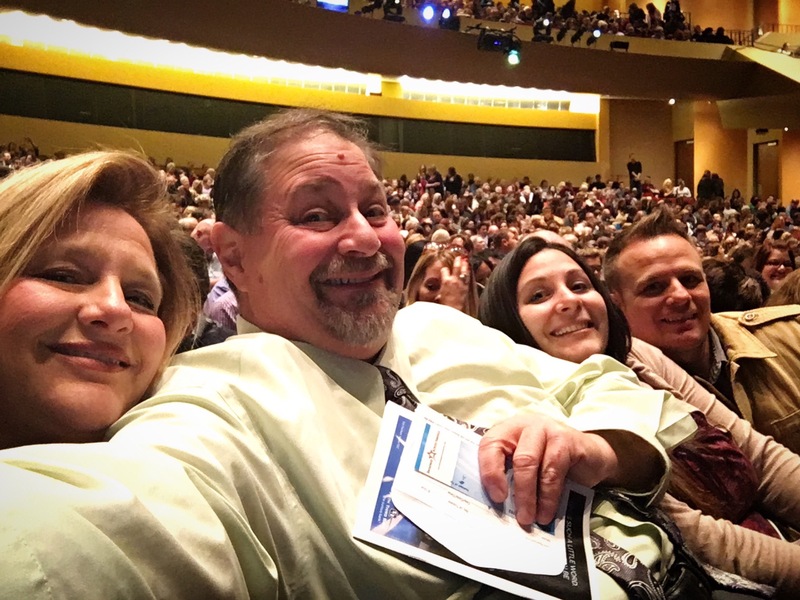 Thanks to Tregoney, we were able to land some great seats…5th row. We could almost touch the actors on stage. The house was packed on this Saturday matinee version of the performance. The venue is a great place to watch a huge production like this…no matter where you sat. But our seats were fantastic. Sumoflam with the stage behind him… a giant dragon that has glowing red eyes and breathes smoke. The curtain is a map of Oz and the Emerald City. Everything about the musical really made it worth the trip and the price of the tickets. The props were very realistic. One of the walls in one of the scenes was covered with vines. It all looked so real (and, after our private backstage tour with Tregoney, we could see that they WERE real!!). 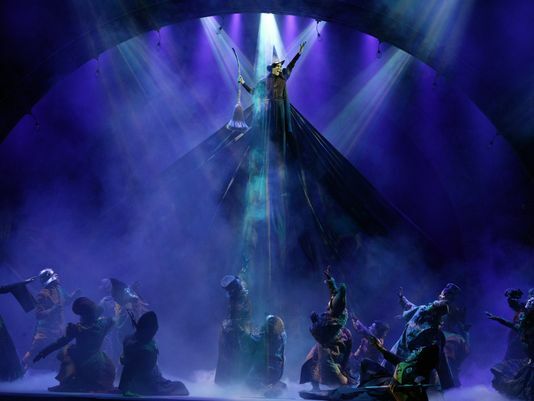 The show had some great scenes, but one of my favorites was of Elphaba flying high above the cast. The lighting was like a burst of light coming from her. It was classic! 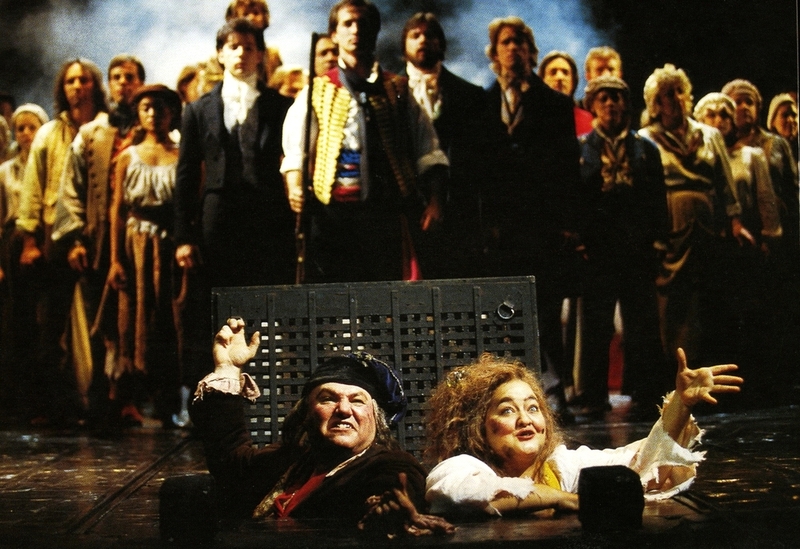 Fortunately, I found a photo on the web from a promotional site that shows the scene (photos were strictly forbidden during the performance and even on the back stage tour). 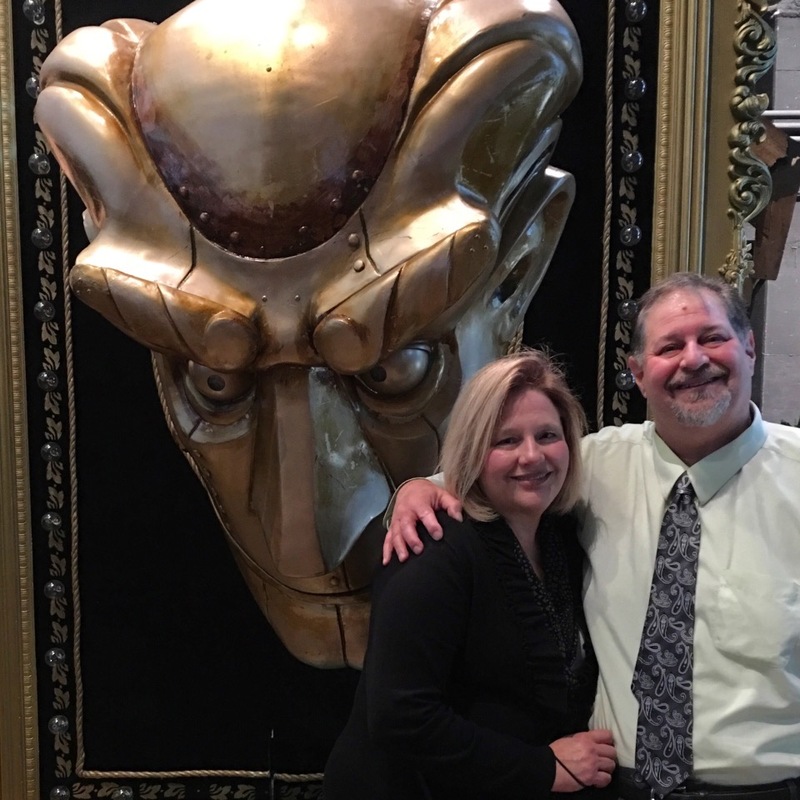 Julianne and David in front of the Wizard of Oz prop from Wicked. This is the only prop allowed for photos. 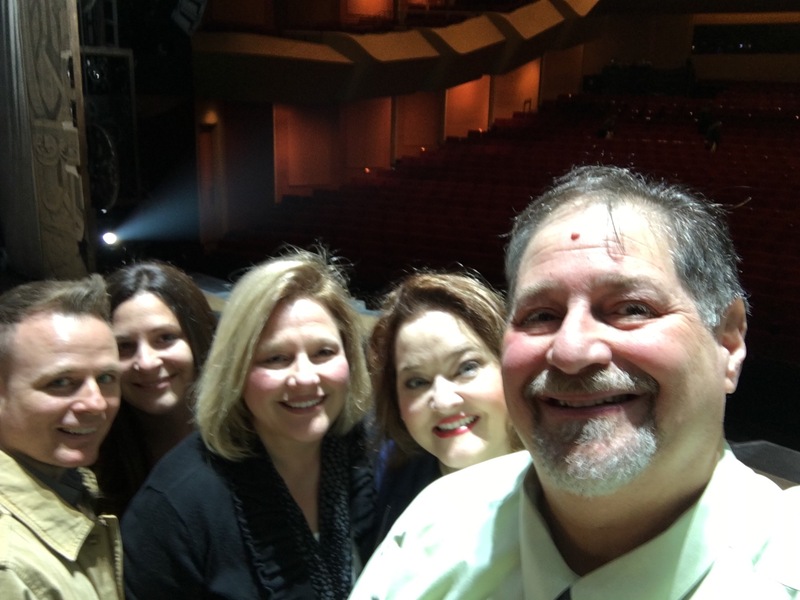 After the performance, we were fortunate to get a backstage tour with Tregoney. Honestly, this was almost as amazing as the performance. We didn’t get to meet any of the actors, but we did get a unique look at all of the props, the stage floor and a close up look-see-feel of the costumes, all of which were obviously handmade and intricate. As noted, photos were not allowed. Everything…the props, the costumes and even the makeup is copyrighted. 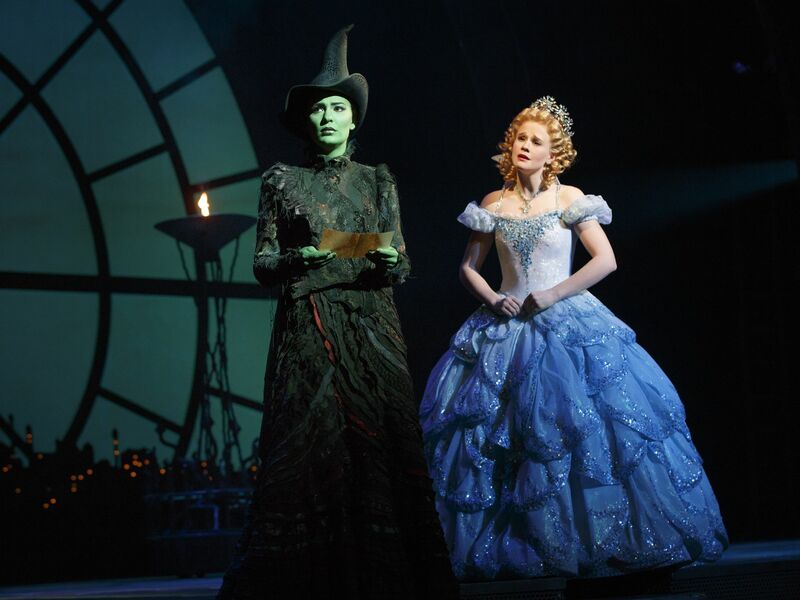 Tregoney explained that the green make-up used on Elphaba is all trademarked. She may not leave the stage area with that make up on and close up photos of her are not allowed. We learned how the actors make their quick changes for scenes. We saw the intricate and custom designed stage flooring that is carried from venue to venue. It contains holes for the smoke and vents for fans to blow wind out for flowing hair and robes. Glinda’s dress, as seen on the right, actually has a carabiner sewn into it to keep her attached to the floating props. These costumes are all very heavy and appear to be not too comfortable. But, they are truly elaborate. Seen up close you can see that no expense was spared. The audience doesn’t see the complexity, but up close it is really amazing (sorry, running out of adjectives). Overall, this was a wonderful experience for us and we are so appreciative of Tregoney who took the time to visit us on Thanksgiving Day and then to bless us with a feast for our eyes in Louisville. 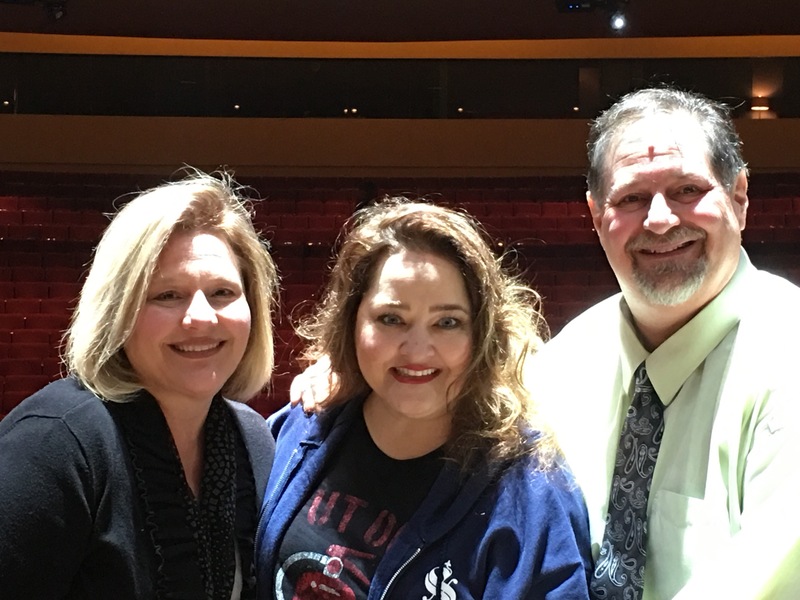 Opportunities to enjoy the arts are a blessing. The creativity of people is inspiring whether it be musicians, writers, actors or even set and costume designers. I count it a blessing to be able to participate in opportunities like this. 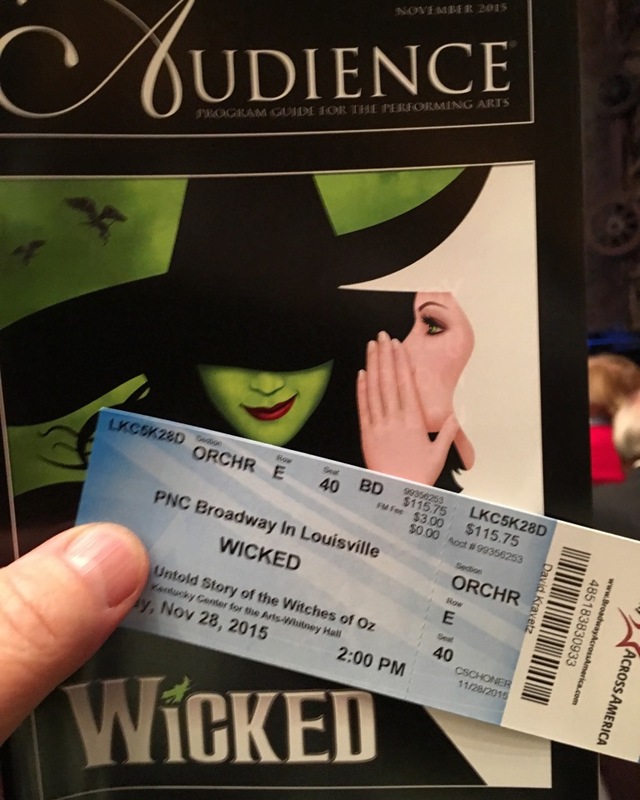 And a final word…Wicked ends in Louisville on December 6. But it will be in St. Louis and Kansas City in the near future. There will be shows in California, Dallas and Houston coming later in 2016 as well. 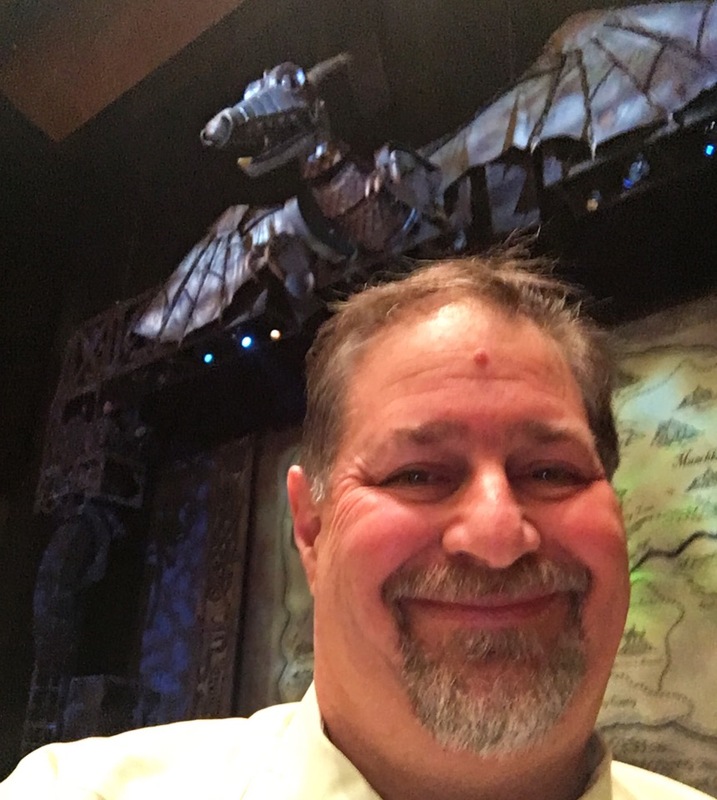 This entry was posted in Blessings, Blogging, Costumes, Countdown365, Gratitude, Julianne, Observations, Selfies, Stage Review and tagged Gregory Maguire, L. Frank Baum, Les Miserables, Madame Thenardier, Mary Poppins, Stephen Schwartz, Tregoney Shepherd, Wicked, Wicked: The Life and Times of the Wicked Witch of the West, Wicked: The Untold Story of the Witches of Oz, Winnie Holzman, Wizard of Oz by sumoflam. Bookmark the permalink.